Pinterest needs to write me a check. It’s costing me (and my guy) a lot of money to keep up with all the amazing ideas I’ve found. Hobby Lobby and Michael’s and Jo Ann’s is making out like crazy. Which, by the way, Michael’s and Jo Ann’s do give a teacher discount just FYI! Maybe I should just buy stock in one of those stores and I’ll get my money back? Probably not. It’s all worth it. I love the times I craft. Reminds me of 4-H days with my mom. Our home is a lot cuter. And, if my plan works my friends and family are going to love me at Christmas when they get these amazing gifts. I need to start now. Another problem is. Everything I make I want to keep for myself. Anyone else have that issue? I’ve got a lot of personal problems I would like to blame on Pinterest as you can see. 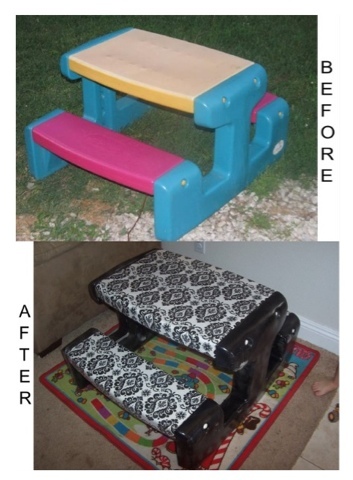 Any amazing Pinterest projects you completed this summer? Recipes you loved? Here’s one completed below. I took cute little Welcome signs from the Dollar store and spray painted over the welcome. Then with puffy paint I wrote my niece and nephews names on them. Then I put a layer of clear coat over since they will be outside. 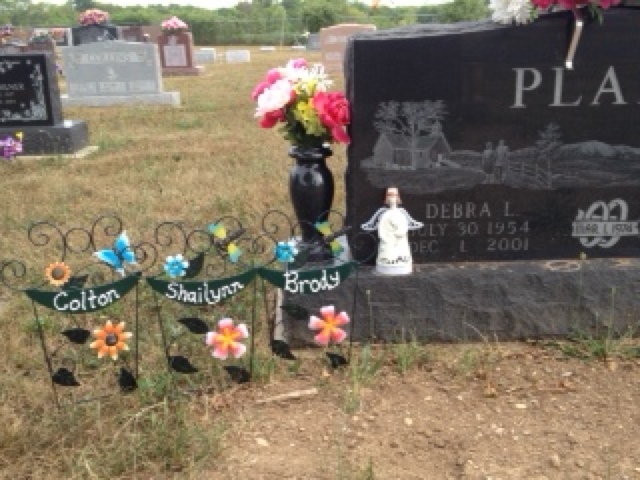 I placed them near my moms headstone to represent her grandchildren. It definitely brightens up her “place” a little. Though she never technically met any of them I know she would love them all dearly. I see a piece of her in each of them. I took the signs to the cemetery last week and had breakfast with her (picnic on the bucket list). I plan to go back in two weeks for her birthday and see if they held up outside or if I need to do some maintenance. I’m just going to leave them until winter and then bring them home. Maybe put them out next year. The next project is more my sister but I plan to help. 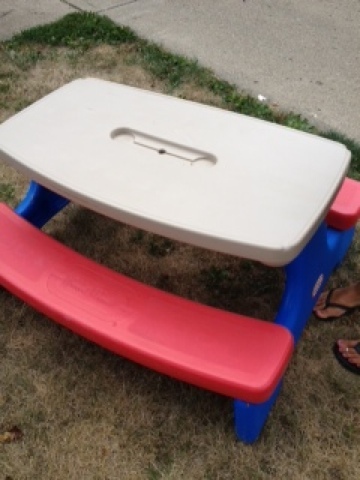 Hey, I bought the picnic table at a garage sale this morning! That’s helping! Let me know if you did anything Pinteresty during your summer! Oh, and please become a “follower” of my blog. It’s on my bucket list to gain a few more. Help a girl out!